Get in and say hello to a whole new level of physical and mental fitness. This is where the sweet spot of a swim spa meets the power of a hydrothermal therapy hot tub. Where the benefits of both are joined to satisfy self-discipline and self-indulgence alike. 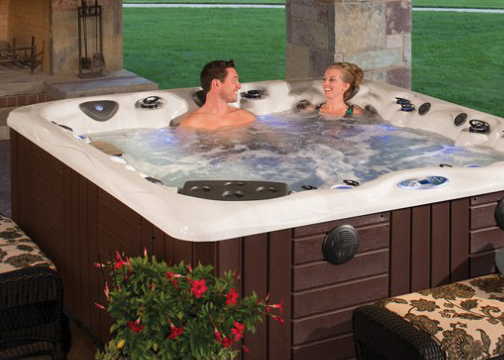 This is the MP Momentum™™ Deep by Master Spas — the best home spa experience of your life. Enjoy the benefits of fitness with a swim spa joined together with our hydrothermal therapy hot tub. The MP Momentum™™ by Master Spas — the best home spa experience of your life. Dimensions 231” x 94” x 51"
All Micheal Phelps Swim Spas provide a smoother, wider current for a superior swimming experience. With design input from Michael Phelps, the MP Signature™ has our largest swim area – perfect for the most serious swimmers, triathletes and fitness enthusiasts – and comes standard with Wave XP Propulsion™ Technology. Dimensions 215” x 94” x 60"
The MP Force® Deep, the shortest of the Michael Phelps swim spas, is almost 17’ long, and was designed to meet a broad range of health and wellness needs. Ideal for swimming, aquatic fitness, therapy, and family fun. Dimensions 201” x 94” x 60"
Dimensions 201” x 94” x 51"
Get in and say hello to a whole new level of physical and mental fitness.This is where the sweet spot of a swim spa meets the power of a hydrothermal therapy spa. Where the benefits of both are joined to satisfy self-disciplines and self-indulgences alike. This is the H2X Trainer 19 and quite possibly the best home spa experience of your life. Dimensions 214" x 94" x 60"
The Trainer 12 includes hydro-fitness equipment* for muscle-defining and strength-building exercises; while Master Spas’ exclusive Xtreme Therapy Seat and Cove delivers luxurious, head-to-toe, muscle massaging and mind-relaxing healing. The Therapool D measures close to 8’ x 11’ and has a massive 60” depth. It has more than 50 jets with three high-performance flow stream jets for resistance training and aquatic exercise. It comes standard with the H2Xercise Kit* for rowing and strength training and a stainless steel exercise bar. The Therapool D is the perfect swim spa for exercise, fitness or family fun and comes standard with waterline LED, water features and stainless steel jets. Dimensions 132" x 94" x 60"
This fitness spa is loaded with high-end features but at a surprisingly affordable price. The large flat floor is perfect for aquatic exercise and rehabilitation, while three high-performance flow stream swim jets provide a current for walking or running in place. At the end of your workout, slip into one of the ergonomic seats, letting the hydrotherapy jets help you to recover and relax. Dimensions 132" x 94" x 51"